The Multi-joint™ spacing system allows you to make 1/4", 3/8" and 1/2" box joints as well as rabbet, dado, spline and sliding dovetail joints (for drawer glides) to any width with no limitation. Brass set-up bars (included) make setting up the Multi-joint very simple. 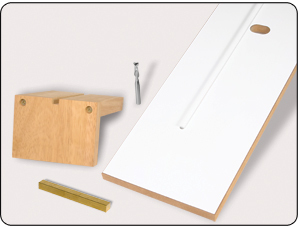 Made from durable laminated MDF with UHMW guide bars for smooth operation. Platform measures 24" long which will fit across most router tables. Use your own bits or purchase one of ours. Please Note: This system is designed to be used on table mounted routers only. Router bits not included. The perfect solution for repetitive size box joints. 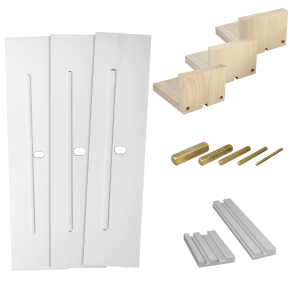 If you simply need to make a specific size box joints on a consistent basis than one of these convenient kits is perfect for you. A Full Set of Instructions are also Included. These are both our standard router Bits and Freud® Comparison Router Bits. Even though are router bits give you long life and smooth cuts, they don't compare to freuds micro grain carbide bits with 10 times more life than any standard bit. 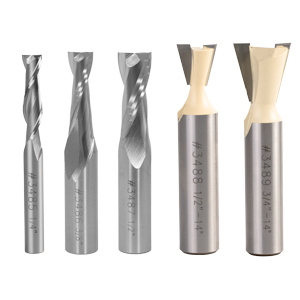 Listed below are Freud® Solid Carbide Up-Cut Spiral Bits combined effective chip removal with a cut that can't be matched by standard straight bits. The dovetail bits produce a smooth intracate cuts. Both style bits are perfect for the Muli-Joint™. The Freud® Router Bits listed are just an upgrade for the standard Multi-Joint Bits. Giving you better and longer cuts.